Genesis Mining, the world’s leading bitcoin cloud mining provider, announced their most significant milestone yet today: the acquisition of their 100,000th customer. Since launching in early 2014, Genesis Mining has separated themselves from the competition with their dedication to transparency, community activism, and constant innovation, which has allowed the company to scale faster and more effectively than many other companies in the industry. In July of this year, the company announced Genesis Hive, a tool that provides enterprise-level cloud mining management to mining companies and providers. In August of this year the company announced Life Inside a Bitcoin Mine, which gives users the ability to watch a live stream directly from one of the Bitcoin mines the company operates in Iceland. In September of this year, the company announced the launch of X11 cloud mining, a service that allows customers to mine via an alternative algorithm. And in October of this year the company announced their U.S.-based Bitcoin advocacy campaign aimed at raising awareness about Bitcoin for mainstream audiences. The campaign launched in San Francisco, Los Angeles, Miami, Boston, and Chicago and featured a variety of creative taxi ads, billboards, and street signs. To celebrate this important milestone, lucky customer number 100,000 will receive $1,000 in free hashpower. 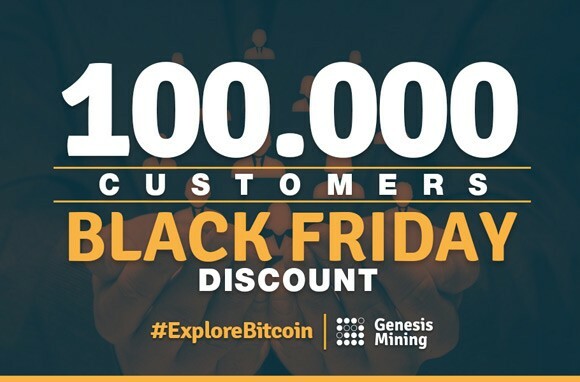 Additionally, Genesis Mining will be giving all customers a discount of 11% for all orders purchased on Black Friday. Genesis Mining plans to continue their creative marketing efforts and dedication to product development over the upcoming year and will be announcing new products, services, and marketing campaigns very soon. To get an 11% discount today you can use the code “Cybermonday11” and a Cyber Monday discount will be applied.